Ceci De Robertis was so terrified when she first started improv in 2012 that she threw up before her 1A showcase. Ceci is an insatiable animal nerd, especially the ones that are not fuzzy and do not have backbones. She is delighted by animal facts (even ones she already knows). Ceci loves to geocache, scuba dive, and fuss over her baby shrimp 50-gallon aquarium and pet parakeets, Chivito and Mate. Ceci De Robertis is an environmental lawyer in Washington, DC. Her job focuses on cleaning up pollution and hazardous waste in an aim to protect human health and the environment. Since graduating from U.C. Berkeley and Washington College of Law, Ceci has clerked for an Environmental Protection Agency administrative law judge and worked as a land use attorney at a corporate law firm. She also has served as the deputy associate director for the White House Council on Environmental Quality and an EPA Agency staff attorney. She is currently a policy advisor for the Federal Permitting Improvement Steering Council. 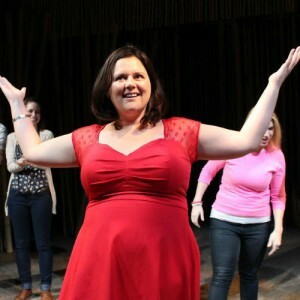 Ceci was also an understudy for The Second City’s Almost Accurate Guide to America during its summer 2016 run at The Kennedy Center and a coach for the former WIT Harold Team Wallawoo. Ceci is now a WIT teacher, WIT player, and WIT board member. She also plays on Improv Actually, the all-female super-group Sweater Kittens, You’re Invited, and the all-Spanish improvised telenovela Sábado Picante.